Learn. Lead. Graduate. Change the World. We strive to touch the hearts and minds of our students, families, and community partners in order to build a strong support team. Our students engage in challenging and worthy tasks that push their thinking to higher levels and build problem-solving and analytical thinking skills. Who the children are is as important as what they know, so we interweave character education into everything that we do. Our students spend each day learning how to become leaders who choose their own futures in high school, college, and beyond. Our educators know the strengths and growth areas of all their students so they can plan effectively and invest their students in the learning process. Kindezi Academy utilizes a small group, rotation model led by two classroom teachers to ensure that every child achieves. 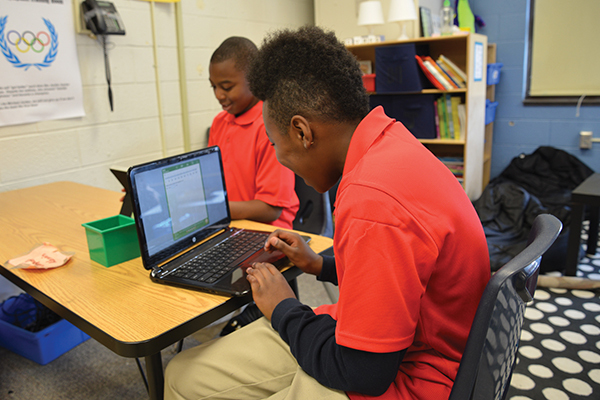 During each instructional block, students rotate through teacher-led instruction, blended learning instruction using adaptive software on iPads, and project-based collaborative work. Through this model, teachers are consistently able to provide personalized and accountable learning experiences. Beginning in kindergarten, all students learn through a proven leadership development program, “The Leader in Me. Through The Leader in Me”. Our students learn and grow in the “Seven Habits of Highly Effective Kids”, while also exploring their own leadership interests through student leadership roles. This leadership education model has been proven to improve school culture, increase attendance, improve academic performance and reduce incidents of bullying in schools. We believe every Kindezi student is a leader who will graduate and change the world. For our students, the path to graduation begins in kindergarten. We consistently model and share the equation: literacy = access = power = freedom. College and career focus is a visible culture in our hallways, classroom, and curriculum.